Mesta Mastic is a traditional hotel in the medieval castro of Mesta. We have three different buildings which used to belong to our grandfather and grandmother. One of the houses was given the name "Monastiriako” (of the Monastery) as it was part of the original Palio Monastiri tou Taxiarchi (the Old Monastery of the Archangel) which is the oldest building in Mesta. It is thought that the monastery was built in 1412 AD. Despite the damaged suffered over the centuries and the destruction wrought by conquerors, the stunningly beautiful iconostasis in the church still remains in excellent condition, and it is worthwhile finding the time to go and admire this superb example of local wood carving. These three buildings were all restored recently, with great respect for the history of the area and its architectural heritage. 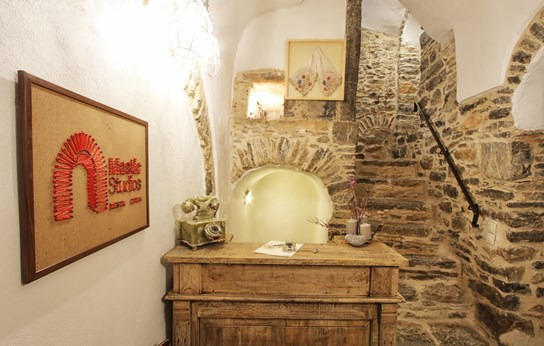 And so today, Mesta Mastic is an amazing complex of rooms, suites and apartments which combine the village’s history with its present-day life. We have not overlooked even the smallest detail of the buildings’ traditional character, and we have blended this tradition with tasteful and unassuming modernity to create a unique holiday experience. The five apartments have a double bed, desk and armchair, a state of the art laptop, a flat screen TV, air conditioning, a hairdryer and fully equipped kitchen with stove and touchscreen hob and fridge freezer. All rooms have been lovingly decorated and furnished with modern luxurious fabrics and furniture in earthy pastel colours, Media Strom mattresses and pillows, toiletries and Italian floors, while the wooden beams that embrace the Chios stone walls create a warm, intimate environment. The rustic rooms differ from the vintage rooms as they are decorated and furnished with different shades of fabrics and curtains and with different styles of furniture. The suites are more even comfortable and spacious and have fireplaces and interior balconies. The rooms are between 14 and 16 square metres and they can accommodate couples or groups of four people. The suites are 50 – 55 square metres. Mesta Mastic are very close to several beautiful beaches, with Apothika, Avlonia, Merikounta Salagona and Agia Dynami all being a 5-20 minute drive away. The village has a wide selection of restaurants and cafes where visitors can enjoy traditional (and not so traditional…) cuisine and sweets. Mesta Mastic are equipped with all modern amenities and can offer visitors high quality accommodation and genuine Chios hospitality. •	Check in time 14: 00 - 18:00. Any delay in arrival time which is notified promptly to the staff will be accommodated. •	No charge for children under 5, if they use the beds already available in the booked room.